I was channeling my inner Gossip Girl when I got dressed. A dash of Jenny, a hint of Serena, and a touch of Blair. If you've never seen (or read) Gossip Girl, I realize that means nothing to you and I'm a bit sorry for you. It's only one of the best "guilty pleasures" known to man kind. Wearing two tones of pink (or any color) is something I've never done and I certainly feel pretty weird about it. But I'll consider doing it again. Also let's talk about this flower crown of mine. It's actually a necklace that I purchased from the best little local boutique in Akron, Noto. The owner, Lauren, is the biggest supporter of the local bloggers, fashion scene, and Akron in general. 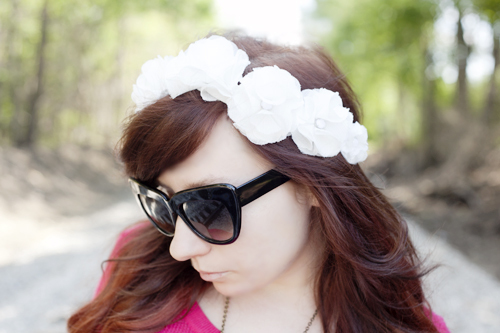 So, when I saw this necklace, I knew I could transform it into a cheap flower crown for every day wear. I probably won't wear it as a necklace, but you never know. It's Father's Day, so holla to my father who is the best dude in the entire world. He can barely operate his iPhone, so I know he won't be reading my blog any time soon, but ya' know. I did post a rad photo on instagram if you are curious as to how rad my dad has always been.